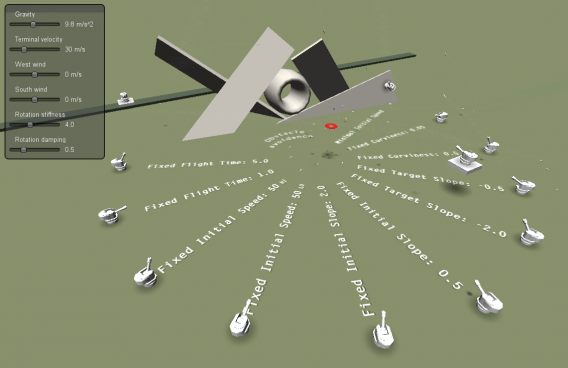 The BallisticTrajectoriesUnityDemo Unity3D project is first and foremost a practical demonstration of the work described in the paper "Analytical Ballistic Trajectories with Approximately Linear Drag." Giliam J. P. de Carpentier, International Journal of Computer Games Technology, vol. 2014, Article ID 463489, 13 pages, 2014. doi:10.1155/2014/463489. (PDF: http://www.decarpentier.nl/downloads/AnalyticalBallisticTrajectoriesWithApproximatelyLinearDrag-GJPdeCarpentier.pdf). You can run this project in your web browser using the Web Player [http://www.decarpentier.nl/downloads/BallisticTrajectoriesUnityDemo/WebPlayer/BallisticTrajectoriesUnityDemo.html] or download the standalone Windows version [v0.1.2, http://www.decarpentier.nl/downloads/BallisticTrajectoriesUnityDemo/BallisticTrajectoriesUnityDemoWin32v0.1.2.zip]. See http://www.decarpentier.nl/ballistic-trajectories for more information. Copyright (c) 2015, Giliam de Carpentier All rights reserved.